In software development, there is an interplay between Software Process models and Software Process enactments. The former tends to be abstract descriptions or plans. The latter tends to be specific instantiations of some ideal procedure. In this paper, we examine the role of work artifacts and conversations in negotiating between prescriptions from a model and the contingencies that arise in an enactment. A qualitative field study at two Agile software development companies was conducted to investigate the role of artifacts in the software development work and the relationship between these artifacts and the Software Process. Documentation of software requirements is a major concern among software developers and software researchers. Agile software development denotes a different relationship to documentation, one that warrants investigation. Empirical findings are presented which suggest a new understanding of the relationship between artifacts and Software Process. 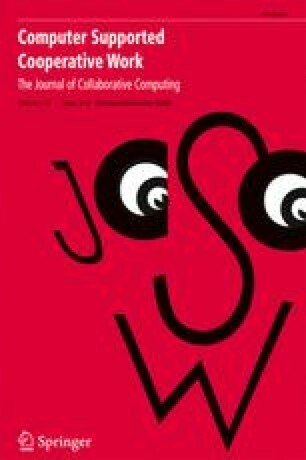 The paper argues that Software Process is a generative system, which participants called “The Conversation,” that emerges out of the interplay between Software Process models and Software Process enactments. We are indebted to our field sites and the participants who consented to be observed and interviewed. Many, many thanks to Rosalva Gallardo-Valencia who was instrumental in the data collection and transcription. Thanks also to Anahita Fazl who helped with the transcription. Yvonne Dittrich provided, reviewed and guided our research direction. This research has been funded in part by the National Science Foundation (Award IIS-0712994) and the Agile Alliance Academic Research Program.